MOSCOW, December 3. /TASS/. 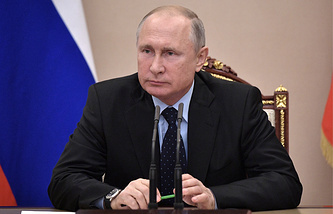 Russia sees no alternative to the Iran nuclear deal and call on all the parties to it to refrain from steps that might push Teheran towards withdrawal from it, Russian president’s press secretary Dmitry Peskov said on Monday. "Russia, like practically all the nations, stands for keeping the JCPOA (Joint Comprehensive Plan of Action) in place. We see no alternative to this agreement. We call on everyone to refrain from steps that might push Iran towards withdrawing this deal. We think that it would have adverse impacts and we condemn the United States for its withdrawal from the JCPOA," he said. Washington’s anti-Iranian restrictions that, unlike the United Nations Security Council sanctions, are not legitimate from the point of view of international law "must not be an obstacle for us to continue our bilateral relations and trade-and-economic cooperation with Iran," Peskov stressed. In May 2018, US President Donald Trump announced Washington’s decision to withdraw from the deal, saying it leaves Iran a possibility to create a nuclear bomb bypassing all the restrictions. He warned the United States would reinstate its old anti-Iranian sanctions and would imposed new ones. The first round of sanctions covering Iran’s automotive sector and trade in gold and metals was re-imposed in early August. Further sanctions came into effect from November 5 and cover Iran’s oil exports and more than 700 banks, companies and individuals. Other signatories to the JCPOA - Russia, China, France, Germany and the United Kingdom - have reiterated their commitment to the deal.